The Wisconsin Legislative Audit Bureau has released their legislatively mandated report on Test Score Date for Pupils in Milwaukee’s Pupil Choice Program (voucher schools). The news is not good for choice advocates. 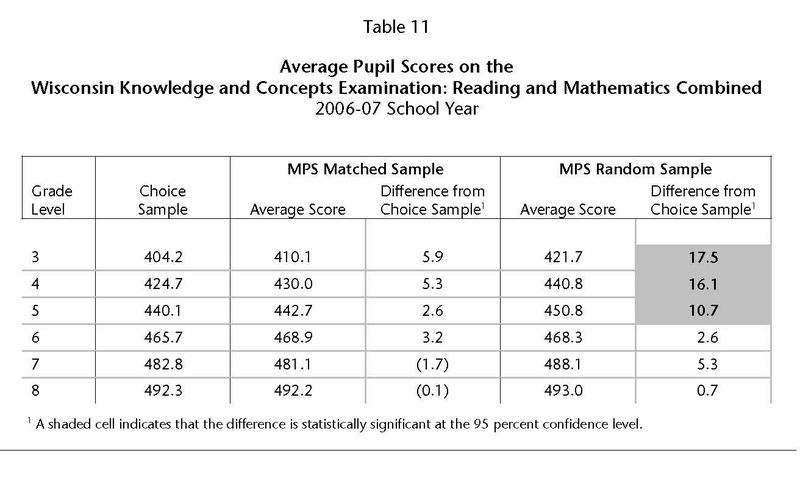 In every instance where there was a statistically significant difference between choice students and students in traditional public schools, the students in the traditional public schools did better. I’m sure there will be lots of spin from all sides, but to me the choice this recommends is very clear. One caveat — I do not now and never will think standardized test scores should be the sole measure of school quality. They are part of the tool kit and in this case a part that favors MPS over choice schools.